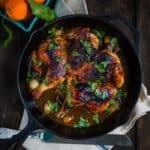 Honey Mandarin Roasted Chicken - An unbelievable juicy, tender and delicious chicken perfect for a weeknight dinner, ready in less than 40 minutes! Preheat over to 475º F.
Place chicken, breast side down, on a work surface. Starting at thigh end, cut along 1 side of backbone with kitchen shears. Turn chicken around; cut along other side. Discard backbone or save for stock. Transfer chicken, breast side up, to an iron skillet and splay it open. Use your hand to press firmly on breastbone to flatten. With your fingers, ease the skin away from the chicken and spread some of the butter mixture inside. Spread the rest of the butter on the outside, all over the chicken. Season with salt and pepper, to taste. Scatter white pearl onions around chicken. Mix in a bowl the mandarin juice, soy, honey, and rice vinegar. Add mandarin mixture over the chicken, and bring the skillet to the oven. Roast the chicken for 30 – 40 minutes, basting with pan juices every 15 minutes. Continue to roast chicken until a thermometer inserted into thickest part of breast reaches 165 degrees. Transfer chicken to a carving board, and let rest 8 -10 minutes. Cut chicken into pieces, and serve with shallots, and pan juices. Mandarins also known as clementines or tangerines. Mandarin Juice: To made the mandarin juice I used a citrus squeezer or juicer. Just peel 3 - 4 mandarins. Depending on the size of the fruit you might need to cut it in half. Put the citrus half in the well of the juicer cut-side down and squeeze out all the juice. Discard pulp. Looking for more chicken recipes? Check these out! !